This item is a set of optional parts for modifying or detailing robot and other science-fiction kits. 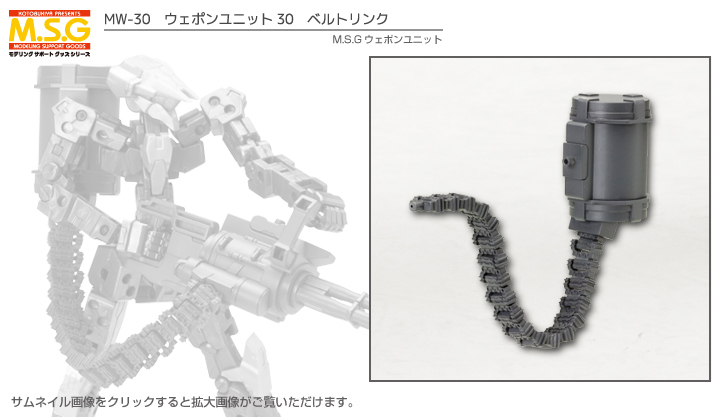 Items designed with the theme of "realistic" appeared on "MSG Weapon Unit Series" which can easily decorate robot models! The 30th line is a "belt link" lineup consisting of large magazines and bands. By attaching to the separately sold "MW 20 Gatling Gun" or "MW 29 Hand Gatling Gun", it is possible to reproduce the heavy machine gunlike form. ■ The belt part is made of plastic, processing, adhesion and painting are possible in the same way as usual plaquit. Furthermore, expressions such as "twist" and "undulation" peculiar to the zip can also be performed naturally by connecting the clearance calculated. ■ Magazines and belts are each connected by 3 mm diameter shaft, it is possible to attach easily to the hard point (3 mm diameter connection hole) provided in MSG weapon unit and MSG heavy weapon unit. ■ By using multiple items of this product it is possible to extend the portion of the band to your choice.